Creating and submitting a virtual Salted Caramel recipe creation. Name your Salted Caramel recipe. Write a creative write-up regarding the recipe, and an ingredient list. Share to your friends in Facebook to ask for "LIKE"
Only 20 "Likes" or more will be eligible to be chosen as finalists in a random drawing. Five finalists will be paired with a celebrity blogger sous chef. Together you will attend the Caramel Master Class and recreate your recipe. 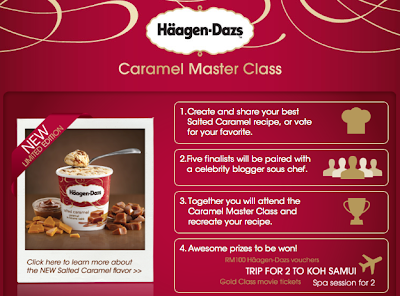 Visit Haagen-Dazs Malaysia Facebook fanpage for more details.